Svetislav Nikolajev has no desire to strive for the UFC, get famous, or any other goals that typical fighters have. Svetislav Nikolajev works, trains, sweats and bleeds just because he wants to fight. Nikolajev began martial arts when he was a young child, before most people knew what martial arts were. At the age of six, he started learning Japanese Jiu Jitsu, later moving on to kick boxing and Muay Thai. From there, he began his fighting career. Svetislav competed in more than 30 kick boxing fights. 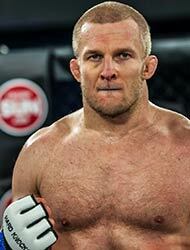 He only started fighting in mixed martial arts because he saw a commercial for a reality show called Ring of Fire, similar to The Ultimate Fighter. He applied for the show, made it and made it all the way to the final. He lost only in the final fight to Bojan “Serbian Steel” Velickovic who is now fighting in the UFC. Svetislav’s professional MMA record is 3-3. He is 32 years old and has been a professional fighter for more than ten years. The age of 32 would seem old compared to many of the new fighters rising in MMA, but he is just as dangerous. Svetislav has knocked out half of his opponents because of his incredible striking skill and power, and years of professional kick boxing experience. One of his MMA losses was a decision and the other two were submissions, which the Serbian attributes to the scarcity of training available to him in his home country. But that hasn’t stopped him. Svetislav has been working on his Jiu Jitsu obsessively. Once his injuries were healed from his fight in 2013, he wasted no time getting back into training and making sure he would never be submitted again. He sought out the best trainers he could find and capitalized on every opportunity to learn. He has been grinding for three years and hasn’t returned to the cage until now. He insists he will beat his next opponent because he has more experience and more fights. Nikolajev also has nothing to lose; he isn’t aiming for the UFC or anything like it, he says. He is here out of pure desire to fight. “I just want to satisfy my urge to compete in the cage,” Nikolajev said. Svetislav puts hours of blood, sweat and tears into MMA because he wants to fight. Not because he wants to make a career, become famous or any other typical goal of today’s MMA fighters; his desire to challenge himself is enough to motivate him through all of his hours of training and hard work. He is also a highly licensed sports trainer in Serbia and works with young fighters on their striking and professional athletes on their conditioning. When asked what he would be doing if he hadn’t discovered martial arts, well, he would still be someone you wouldn’t want to mess with. Svetislav says he would probably be like Bear Grylls, renowned British adventurer and survivalist. Nikolajev is a strong, dangerous, experienced fighter with years of training and world class competitions under his belt. He fights just for the burning desire to fight and wouldn’t have it any other way. He specifically sought out Hard Knocks Fighting Championship because he had been following the fights, watching the level of competition and wanted to be a part of it.